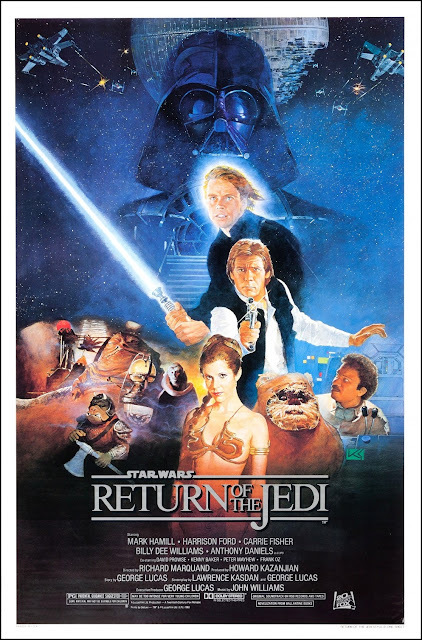 Chrichton's World: Review Star Wars: Episode VI - Return of the Jedi (1983): Ewoks rule! Review Star Wars: Episode VI - Return of the Jedi (1983): Ewoks rule! A lot of fans seem to despise Ewoks. While at first glance they do seem a little out of place there are some redeeming elements to them. For some reason George Lucas wanted these creatures in Return of the Jedi and I was and still have no problem with it whatsoever. Because in my opinion these little cuddly and fuzzy creatures are easily one of the most dangerous species in the Star Wars universe. They are very effective killers. Their spears and arrows never miss their target. Most targets are dead before they know it. And they have no problems whatsoever eating their enemies. Somehow people get hung up on their cuteness that they completely forget how bllood thirsty they are. They rarely are considered a threat until it's far too late. In my opinion they are far more dangerous than any Jedi or Sith Lord. So to say that they were put in to sell toys is doing them a big injustice. Some fans can't belief that these little creatures were able to overpower the most evil and sophisticated armies with ease. You obviously weren't paying attention that is the whole point of the Ewoks. They were so deadly and efficient because they made use of guerilla tactics. The same tactics used against the Americans by the Vietnamese in the Vietnam War.. So that is why the Ewoks are a good addition to the franchise. Whereas The Empire Strikes Back was very dark and bleak Return of the Jedi is the part where the rebels are beating and overpowering all the adversaries in their way. Luke's skills have improved and sets out to right the wrongs that have been done to him and his friends. It's sheer joy to see him be the Jedi Knight he aspired to be. Even when he himself thinks he has yet to complete his training. After rescuing Han Solo in spectacular fashion he returns to a very sickly Yoda who is dying. One of the most sad moments in the franchise. He does inform Luke that he has nothing to teach him and that Luke will be a Jedi Master once he defeats Darth Vader. Luke knows deep down he is capable of doing that but he is not willing because he refuses to believe that his father can't be redeemed. For me this always was the most interesting in Star Wars. It's relatively easy to be angry and give into hate. But it's so much harder to love, forgive and be positive. If there was any doubt then now you got your proof that the light side is always stronger than the dark side. Naturally The Return of the Jedi ends with the long awaited victory and celebrations. The rebels had fought hard and bested the evil Empire. Then why oh why would they let all of it go to hell in The Force Awakens with wannabe Empire called The First Order. Explain that to me? Just makes my blood boil. Anyway The Return of the Jedi is a good conclusion that has a lot to offer spectacle and drama wise and makes you feel good at the end. What more do you want?